In 1988, the government of Ecuador granted the first concession for Block 10, located in the southern central part of the Ecuadorian Amazon, to a consortium made up of AGIP Petroleum (now controlled by ENI), ARCO Oriente INC, and Denison. Immediately, indigenous organizations have rejected the company’s presence in their territories : the Organization of Indigenous Peoples of Pastaza (OPIP) and the Confederation of Indigenous Nationalities of the Ecuadorian Amazon (CONFENIAE) immediately began a campaign of resistance to this project. Then, in November 2010, ENI-AGIP signed a new contract with the Ecuadorian government for the exploration and exploitation of Block 10. In the negotiations, the company procured a modification to the size of the block so that it also covered the Onglan, Moretecocha, and Jimpikit fields. The indigenous populations and organizations were not informed that the boundary of Block 10 had been modified and that it now affected their territories. They only became aware of this recently in 2013, when the Ecuadorian government began a “socialization” process about the enlargement of the extraction operations in Block 10. 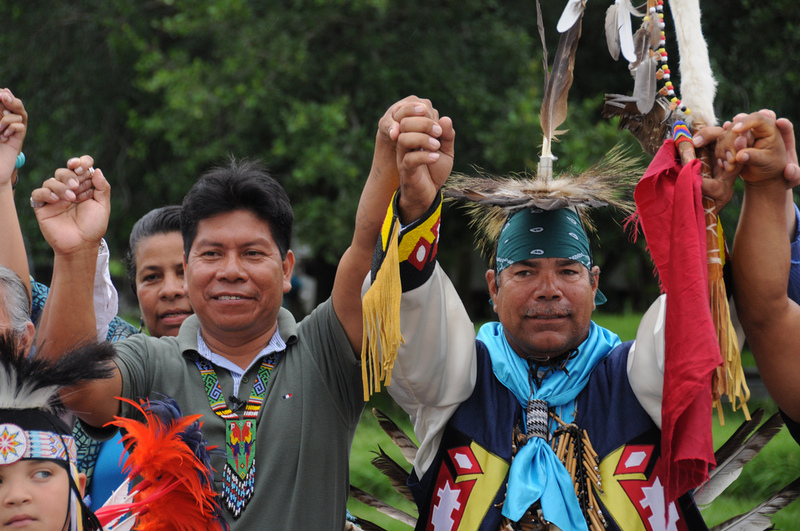 All the communities living on these territories organized assemblies during which they decided to strengthen the relationships within communities so that they could better move forward with the struggle against the abuse and discrimination by the AGIP Oil Ecuador company over Block 10. On Sunday, May 13th, before dawn, the house of Salomé Aranda, Dirigenta de la Mujer y Familia from the Moretecocha Commune, was bombarded with stones by unknown assailants. During the attack, Salomé and her family sheltered inside the house as they feared the assailants were armed and trying to flush them outside. When the neighbors heard the rocks against Salomé’s house, they ran out which caused the attackers to flee into the forest. Salomé belongs to the “Amazon Women Defenders of the Rainforest Against Natural Resource Extraction” collective and was one of the representatives sent to meet with Ecuador’s President Moreno on March 22nd. In that meeting, she highlighted the social and environmental effects suffered by the communities within the area being exploited as “Block 10”. This entry was posted in Corruption and whistleblowing, Economy, Human rights, Latin America and tagged Ecuador, justice, Latin America, peace, victims. Bookmark the permalink.